There's a big change coming to Google Search on April 21st. 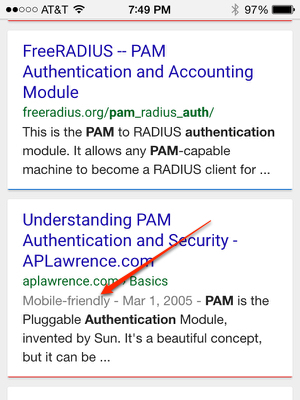 You can see it now when you google on a smart phone: some results are marked "Mobile Friendly" and the rest are not. Right now, that doesn't affect rankings; as you can see in this search I recently ran, an "unfriendly" page ranks above my own "friendly" page on the same subject. Presumably my page will rise above that and other not-friendly pages after April 21st. Note that this is ONLY true for mobile search and seems to be limited to small screens - that tag does not appear when I search on my iPad. According to 9 Things You Need to Know About Google's Mobile-Friendly Update, it won't affect desktop search either, but they do point out that a non-mobile-friendly page may contribute to higher bounce rates, and that may well affect desk top results, so leaving your pages unfriendly doesn't seem wise. I've made the necessary changes on this site. Google opines that making your site mobile friendly will increase traffic and lower bounce rates. I haven't observed either of those yet, though I have seen a large drop in Adsense revenue. I'll update this page after the 21st. This Forbes article (link) says that mobile is growing and notes "As advertisers realign their ad budgets in favor of mobile devices, chances are that desktop revenue per search will suffer. "